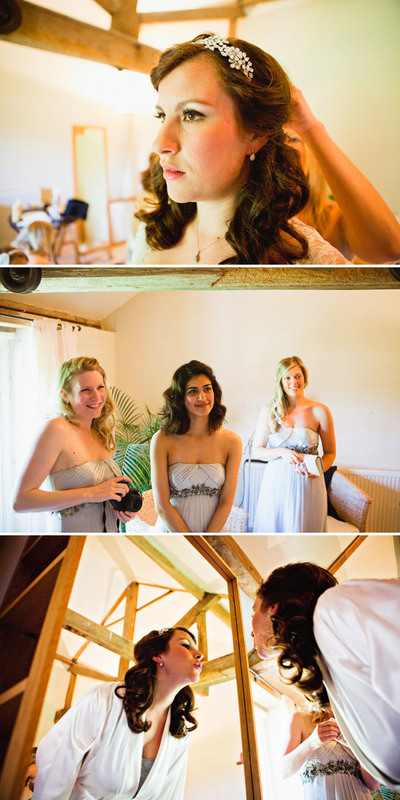 Is it wrong to like images of Brides in rollers? well I do. Fact. There is a certain vulnerability to it, a certain innocence if you like. 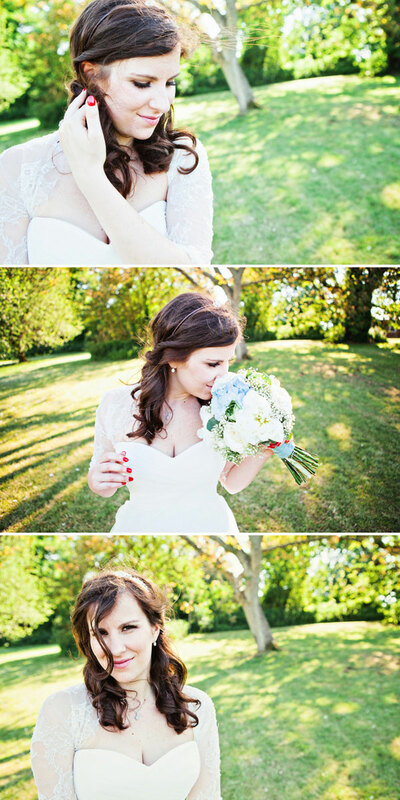 What’s immense about bride Fabienne is that she transforms in to a total fox. All red glossy finger-tipped square inch of her. She and Jerome make an uber attractive couple and their sunset portrait back-drop is delicious, all thanks to photographer Andy Squires. Oh and Jerome calls Fabienne his “chou” which is French for cabbage…. I like this term of endearment very much indeed. I had the most disastrous hair and make up trial possible. I was partly to blame as I was too shy to say on the spot that it was terrible, the hair was fine but I called later that month to cancel as she had covered me in Gold and all of the curls had fallen out by the time I had got home. So I decided to do the hair myself, which was risky as I only did one practice the eve of the wedding and when hair goes into rollers they can sometimes be disastrous as they wont sit in the right place! I felt so much more comfortable doing my hair myself as I know how my hair works and I don’t go to a constant stylist who I trust. For make-up I did a lesson with Mac and bought everything I needed and I did a practice with my friend Chloe, who is super talented at make up and she came and did it for me on the day. I was so excited when I started to look for wedding dresses, as a textile designer, it was the fabric of dresses I would feel first before I would try on the dress, its what comes naturally to me and as soon as I felt “Pergola by Pronovias” I needed to try it on. I loved how it nipped me in at the waist and the sheer little jacket, and the softness of the lace and sheer fabric layers. I wanted soft lave and flowing fabrics. I got it from my local wedding dress boutique called The Ivory Boutique, the team at The Ivory Boutique were at a different level to the others shops I had been to, they were so welcoming and fun. I was a little worried about having no straps with the dress, but the team made me some which I never ended up using as the dress is so well fitted they we right that I wouldn’t fall out of the dress, even though my maid of honour didn’t tighten me in to the smallest setting. As soon as I tried on a veil, I knew I wanted one! I figured I might as well go for it, and loved the feel of the Pronovias veil, and because of the lace on the dress I didn’t want the veil to distract from the details of the dress so I went for a plain long veil which was made with the same fabric as some of the dress. I wanted to find a headband with a bit of sparkle as my jewellery which were diamonds I had for my 25th birthday which were very discrete and I’ve never understood why brides keep their veils on for so long, I knew that as soon as I would get to the reception I would be taking of the veil and I wanted something in my hair. I found a headband on ebay- which was risky but as soon as it arrived it was a perfect. I also bought some grips for my hair at the back, which properly weren’t needed but added an extra sparkle. All of the ushers wore black suits, I thought they would all wear ones they owned already but all of them went and bought a new one for the occasion. I wanted it to be classic style, so I gave them all a gift bag, which had a white tie, groovy, socks and I white cotton handkerchief with a print out explanation of how to fold it into their pocket. The bridesmaid’s dresses were wedding dresses from Monsoon, I love the soft flowing fabric, the light grey/blue and the beaded flower detail, which not only resembled my engagement ring but also had hint of gold which was part of our colour scheme. Whilst at work at a trade show I came across Tutus which were exactly the same colour as the long bridesmaids dresses, I immediately got them as I wanted the younger bridesmaids to have fun and as I know they love dress up, they would wear them again. These were from Bob and Blossom, I teamed them up with a cream top, jewelled cardigan and pumps from Monsoon. I also gave them a headband which was from angels face, who also do tutus. Jerome calls me Chou which is French for Cabbage, so cabbages were a must in our flower arrangements, I had them in my bouquet and in the top table arrangement, our top table arrangement was a tall vase with all of the flowers that were also in my bouquet. 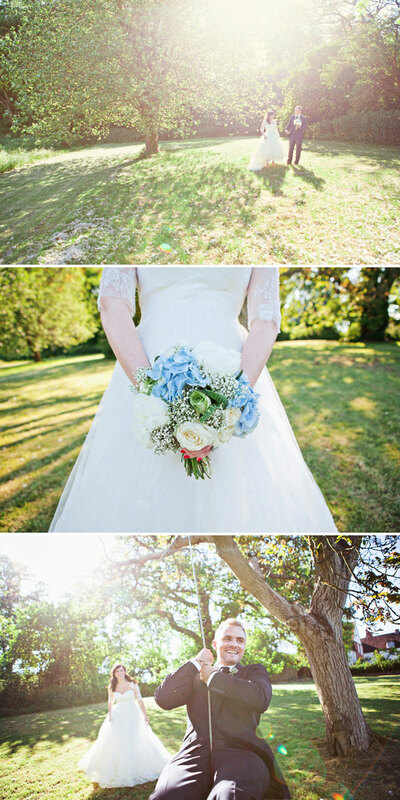 My bouquet was also filled with white roses, peonies, gypsofilia and hydrangeas. For the buttonholes and bridesmaids bouquets we had gypsofilia and the little bridesmaids had mini versions of my bouquet, all where tied together using some duck egg blue yarn I had provided. The Lavender Hill Company understood my concept perfectly when I met with the lovely owner Sue. I then travelled and accumulated lots of glasses, vases, goblets and crystal vases for the table centres. I wanted to have 5 tables with gypsofilia trees in tall glass vases surrounded by little vases at the bottom filled with more gypsofilia, blue hydrangeas and white roses. The remaining tables were using glass candelabras with rings of gypsofilia or vases filled with flowers. Where I bought my wedding dress they also have a company that do bespoke tailoring called roomten. Jerome got himself a made to measure suit, where he was able to have fun in selecting the style, fabrics, colour himself. Embroidered inside the jacket is our wedding date so he can never forget! He had a tie made using the same fabric as his suit, and bought a white shirt from Reiss. He went for a timeless, crisp, classic deep navy/black suit with a matching waistcoat and I’m so pleased we went bespoke because he looked fantastic and it is something he can treasure forever and wear again. As soon as I saw Andrew Squires images on his blog, we knew we had found who we were looking for. 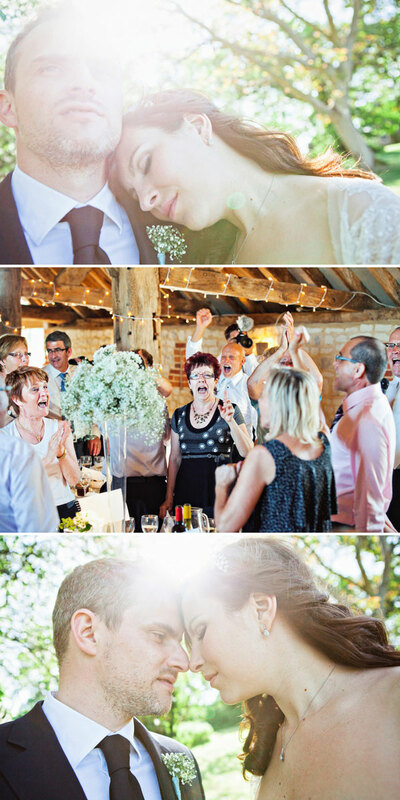 We wanted images that were documentary style, relaxed and capturing key moments of the day, and a photographer who would be excited to be there and fit into our day and surroundings. Andy did just that, I could only remember seeing him during the couple and group pictures so once we received all of the images we were so excited to see all of the pictures he had captured without anyone noticing. I can’t believe the number of gorgeous images he took of us during the ceremony and throughout the rest of the day and never once being intrusive. Along with the videographer team it felt like we were being followed around by some friends, messing around together to get some unique shots. We had a lot of family members from France who were unable to come so filming our day was a must. We were recommended Andy (another Andy!) from www.andrewmarshall.tv who created a gorgeous film and trailer of our day working with Russ from www.whitestarpictures.co.uk, together they also captured key moments we missed or would have forgotten which we would treasure together forever. I had designed my cake in my head but trying to find someone who not only made yummy cakes but was also a designer was proving to be difficult. It’s rare to find a delicious baker who also designs amazing cakes. At another work trade show, as soon as I tasted one of her cupcakes and saw the design effort she put into them, it was decided Jose Fines Cakery was our baker! Plus she lives 3 minutes away from our studios, which was a bonus when I went to meet her. Our first dance was chosen 2 days before the wedding, as we work together we had spent months listening to all of our iTunes and then putting them in a playlist to help make a final decision. Which ended up being a list that became super long but when we heard the song again Desire- Under Your Spell it reminded us of why we loved it, the words and tempo of a slight modern electric jazz, were what we wanted. We hate dancing slow dances and the idea of people staring at us was very daunting but once we were on the dance floor after the first few beats we forgot about everyone else. We hate tribute acts, old men who shouldn’t be doing it anymore trying to be cool, that was not for us at all. Luckily we knew who to call, a friends band who also sang at one of my bridesmaids wedding and for the future wedding of Chloe who did my make up. Rich Austin and the Maestros. They are beyond any doubt the best wedding band I’ve seen and heard, they make the music theirs to you feel your at a concert. As a sideline which we have been slowly developing Jerome and I have styled a few events and weddings, so there was a little bit of pressure from a few of our designer led friends/clients who expected something unique. Being super busy with other projects and work we were never able to do the amount we had intended on creating, I found it difficult to cut back however, J was right – I would have been asleep in the corner at my own wedding had we of done everything as planned! I was handweaving ribbon to tie the cutlery together on the tables, but after a few hours I realised, I could live without it! 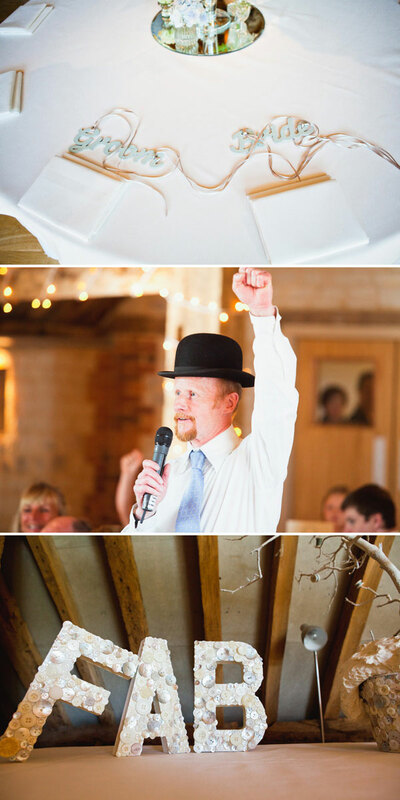 I’m a textile designer specialising in woven fabrics, so we had to have a hint of that running throughout the wedding. For instance using the yarn around the buttonholes and bouquets and cake stand. I bought of ebay 150 wooden bobbins, which I sprayed white and whilst J was on his second stag night along with my mum and bridesmaids we wrapped them using different yarns in blues and golds. These bobbins where placed by each place name with buttons and dried hydrangea petals scattered across the tables. I sprayed in white some 3D letters of FAB & JB which I then covered in buttons, this went on the table up on the balcony where we made a wishing tree which we sprayed white and I covered the pot also in buttons. Did I mention there was a glitter ball? Lolly will be bopping on the spot in excitement at the very sight of it. Red nails. Veil down. And a groom called Fab. I am so jealous, but in the nicest possible way of course! I am currently being called Mary Betty by someone…it’s a reference to Mary Berry who he thinks I dress like (I am not insulted, she is also known as fashion queen Berry so who cares). It was however bad when I was wearing a grey knitted jumper from Topshop with roses all over it…we were kind of midway through something and we had to stop…”It feels like I’m sh*gging Mary Berry!”….This week’s overshare by Pamela has now been completed. I love Fabienne’s hair, can’ believe she did it herself. Any tips on putting rollers in without getting frizzy bits and them kind of stuck?! Pronovias is my favourite, I just can’t decide which one! I love the transformation that comes about when the curlers come out! Your hair was gorgeous Fabienne as was the make up. 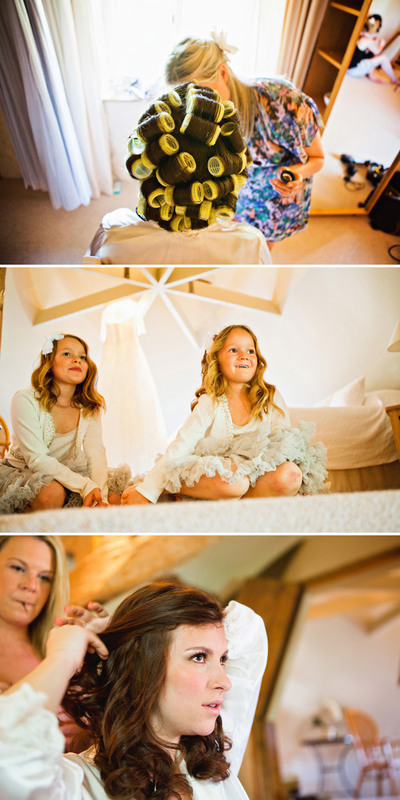 I just love the lace jacket, so pretty and all the bridesmaids dresses are gorgeous, particularly love the flower girls complete outfits. 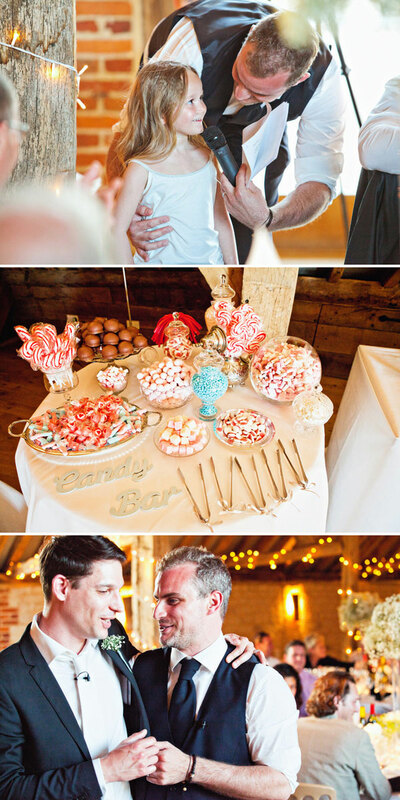 I love a theme which connects to the couple so the buttons and all things sewing connect to the textile design element – love it. 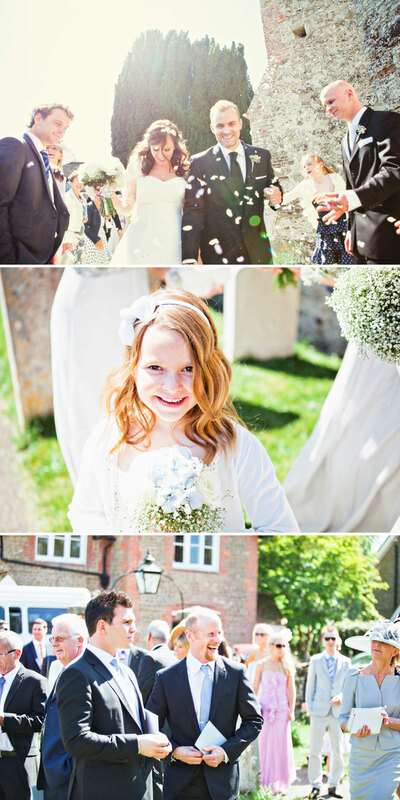 Ooooh – lots of gyp, fru fru little bridesmaids dresses, beautiful bride – what a lovely montage! But I love Fabienne’s red lippy more! To die for! @Pamela I like your ‘overshares’ – they make me feel more sane. Not that you’re crackers or anything – it’s just that I overshare too. God…now I sound like I’m digging my way out of a hole.. moving on. Gorgeous blooms. And while we’re on the topic, please can we have a straw poll? All my life, I’ve known gypsophila as “gyp-zoh-feeel-a”, that’s how my Mum says it. But my Mil says “gyp-so-filla” as if to rhyme with the end of ‘polyfilla’. What lovely pictures and such a beautiful film of the day – it’s like the most romantic movie ever and you’re the star! Awesome use of buttons. I like buttons. Also the sun is to die for. B E A U T.